Barking dogs can be a real nuisance, especially if you live in an apartment or neighborhood with homes close together. While it's possible to train a dog to bark less, some people just prefer to get a dog with a low tendency to bark. There are a handful of breeds that naturally bark less, which is good news for your easily-agitated neighbor! 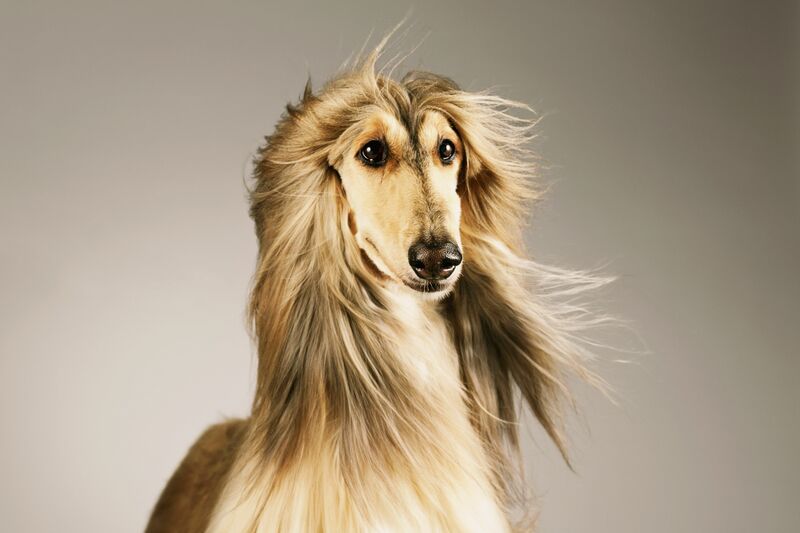 Easily recognized for its long, flowing, silky hair and large size, the Afghan Hound seems like a bit of a celebrity in the canine world. This breed is generally quiet, independent, dignified, and aloof. However, its playful and affectionate sides shine when the breed is around trusted humans. Afghans are intensely loyal to their human families. Afghan Hounds require a lot of grooming care, so this breed is not right for everyone, especially those seeking low-maintenance pets. In addition, the breed has a stubborn streak that makes training essential but not exactly easy. The breed is relatively energetic and needs a good amount of exercise each day. The Akita is a noble and stoic dog that generally only barks when necessary. This large, alert dog breed makes an excellent guard dog and will generally only bark to alert you of danger. The Akita is not for everyone. Don't expect to be showered with affection and begged to play. However, the Akita is one of the most loyal dog breeds around. This breed tends to form an intense bond with one or two humans and lives to protect them. Akitas often act aloof or reserved around strangers. They are very intelligent and often have a stubborn streak. Firm, consistent training is an absolute must, but remember to keep things positive. When in a comfortable environment, the Akita will show its playful and affectionate sides. The Basenji is often remembered as the breed that doesn't bark. In part, the Basenji is considered relatively quiet because it cannot bark like a typical dog. Instead, the breed makes a kind of yodeling sound when vocalizing. These dogs are not especially vocal, but they are also not silent—it all depends on the situation. When excited, expect the occasional yodel, squeal, or whine. Basenjis are relatively small dogs with independent personalities. This is another breed that requires much thought before getting one. They are known for a stubborn streak that can make training a challenge (but also an absolute necessity). They are fairly energetic and need daily exercise to keep them happy and healthy. The Bernese Mountain Dog is a huge dog with a great personality. They are generally quiet unless there is something worth barking about. This breed is a pleasure to live with if you can accommodate a large dog breed. The Bernese Mountain Dog is loyal, playful, and eager to please. Most respond well to training and enjoy the bonding time. Their exercise needs are somewhat high, especially in their younger years. The Cavalier King Charles Spaniel is a small to medium-sized dog breed that tends to look like a puppy forever. They are not especially vocal dogs but may bark a little to alert you of a stranger. Playful and affectionate, they are a pleasure to live with. If you have a Cavalier, you will have a friend and a snuggle buddy for life. The breed's medium to long coat requires some care in the form of brushing a few times a week. Otherwise, they are fairly easy to care for. Most respond very well to training and require only a moderate amount of exercise. The Chow Chow is a stoic, independent dog breed known for a bear-like appearance and bluish-black tongue. The breed is generally not a barker unless is senses danger. Even then, the breed is not especially vocal. The Chow sometimes has a reputation for being aggressive, but this is mainly because they want to protect themselves and their families. Most chows are loyal and calm dogs that make excellent companions. They can be stubborn and need plenty of careful training. Their coats require a fair amount of care to keep them looking clean and healthy. Exercise needs are moderate to high depending on the age and the dog's individual needs. Made famous by the "Lassie" TV show and movies, the Collie is a much-loved dog breed. Large yet graceful, the Collie is generally quiet until it has something very important to say. Despite being medium-large in size, the Collie may seem smaller due to its graceful and gentle nature. This breed makes an excellent companion for all types of homes. Coat care is essential and can seem extensive unless you plan to keep the coat trimmed short. However, the Collie mainly needs to be brushed out a few times a week. Exercise needs are moderate to high, and training is generally quite easy. The Greyhound is one of the few hound breeds that can be considered quiet. This breed tends to bark very little and is kind of a homebody. You may think the Greyhound wants to run all the time, but the breed can actually be a bit of a couch potato. They still need a fair amount of exercise but nothing too excessive. Many people adopt Greyhounds from the racing world. It takes time at first to teach these dogs about living in homes. Many need to learn how to use stairs and how not to walk into (or through) windows. However, once trained, the Greyhound is a gentle, loyal, and quiet companion. The Newfoundland is a big giant teddy bear of a dog. This is an affectionate dog that is intensely loyal to its humans. Barking is not common unless your Newfie needs to warn you about something. The Newfoundland is a giant dog that needs to be in the right home. They need plenty of exercise, but not as much grooming as you might think. Newfies are very responsive to training and really just want to please their humans. The Saint Bernard is often pictured as a first aid dog in the Alps, transporting medicine through the snow. This huge, gentle beast can make a wonderful companion for those who have the ability to care for a giant dog breed. Saint Bernards are generally quiet unless they feel they must warn you of danger. In general, these are highly loyal and affectionate dogs that seem eager to please. Be sure to take enough time to train this breed, as they need to be controllable at such a large size. The breed can get easily distracted, so you will need to put some effort into training. However, the Saint truly enjoys spending times with its humans. The Shiba Inu is a quiet and inquisitive dog that may seem aloof, reserved, or even standoffish at first. This breed is generally stoic and independent but is adaptable and devoted to its humans. Overall, the Shiba is quiet and unlikely to bark. The Shiba has minimal grooming needs and average exercise needs, but training can be a challenge. However, once you have bonded with and trained your Shiba Inu, you have a loyal companion for life. Like its cousin, the Greyhound, the Whippet is a generally quiet dog. The Whippet looks a lot like a smaller version of the Greyhound and has the same general needs. Exercise is important; the breed's needs are moderate to high. Training requires consistentcy and firmness as the Whippet can become bored, stubborn, or distracted. Though Whippets may sometimes appear reserved around strangers, they are playful and affectionate to their families.